Age or make your own spirits 10x faster. Size really does matter and in this case, "Smaller is Better". Reduce the size, increase the surface to volume ratio. Physics at it's best!!! Simple to use. Just add included essence to the barrel and top off with a neutral rail vodka, grain alcohol or moonshine. Age to taste. The barrel can be used over and over again up to 8 years. Charred Oak Barrel, Bung, Spigot & Aging Stand, Cleaning Kit, Funnels, Storing Tablets & Instruction Card Included. 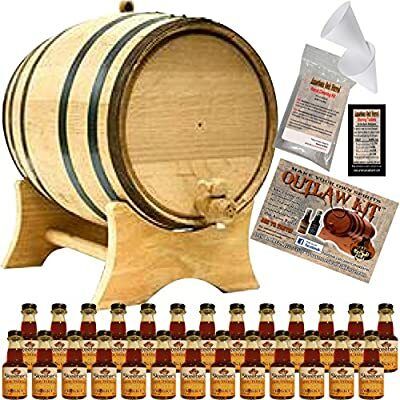 Outlaw Kits include everything to care for your barrel and create your first batch. Easily stores on your counter, bookshelf or make it the keystone on your home bar. Gold PVC Capsules - 100 ct.
Gold Zork Closures - 30 ct.